The 38 metre classic raised pilothouse motor yacht Odalisque has changed central agencies and is now listed for sale by AJ MacDonald and John Weller at Camper & Nicholsons International. Designed by De Voogt Naval Architects, Odalisque was built in steel and aluminium by Dutch yard Feadship to ABS class and delivered in 1973. An interior by Dee Robinson offers accommodation for seven guests in a full-beam master suite, a VIP suite and a triple cabin while twin 610hp Caterpillar engines give her a cruising speed of 12 knots and a range of 3,500 nautical miles at 11 knots. The main saloon of this yacht for sale comfortably seats eight guests with plenty of room and includes a games table perfect for quality family time. Forward, the yacht features a private study and intimate dining saloon with a walnut dining table seating up to eight guests. Her aft deck is suited for al fresco entertaining with dining options for eight guests, while the top deck accommodates the tender, and the foredeck offers an additional seating area. 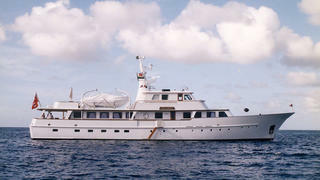 Her gorgeous lines are a perfect example of the classic Feadship profile. A comprehensive refit in 2008/09 included a three-metre transom extension, new Quantum zero speed stabilisers, new carpeting and much more. She has been continuously maintained by her captain to exacting standards.